To our surprise, it was the first time when the players’ assessment of the situation on board was diametrically opposite. Both claimed an advantage – maybe because both wanted to win the game and the match. However, it ended in a draw by perpetual, thus postponing the match conclusion by one day. – Vladimir, what is your score against Topalov in rapid chess, and will it affect the outcome of the tiebreak in any way? – The match booklet states it is +4 in my favor. However, it counts rapid and blindfold games to-gether. Will the score matter? I hope it will, but actually tiebreak is a lottery. A lot will depend on small details: luck, night’s sleep, etc. It is impossible to predict the result. In principle, I already won the match from my point of view, so I think this will make playing easier for me. – Could you do without tiebreak? What can you say about today’s game? – It is a very interesting and combative game. I exerted pressure, but the opponent managed to create counterplay and made a draw. Maybe I could play more accurately, I cannot tell without de-tailed analysis. But the draw is generally logical. – Modern chess theory develops in such direction that it is very difficult to find sharp positions with advantage. So it is not surprising that both opponents were satisfied with a complex position. Maybe my advantage wasn’t big, but playing White was more pleasant. Veselin was lucky to or-ganize his defense on time, but there was a chance for me, too! I did my best, but alas… I played for a win, but did not want to go too far. My attitude in the Game 10 was the same – and that time it worked. – Are you superstitious? The tiebreak is scheduled on Friday, 13th… Also, tomorrow is 13th, 10th month, year 2006, and the sum of all digits gives 13. Kasparov would have been very pleased, and what about you? – Which color is better to have at the start of the tiebreak? – I think it doesn’t matter. Tiebreak is decided by nerves. – You wrote an open letter before the 11th game. What further steps will you take, and do you think the unification idea works? – One could note certain rotation order of your suits during the match against Kasparov in London. Why did you alter it today? – I began to experiment by the end of the match: wearing the same dress is boring. I changed trousers and jackets, and even combined a jacket with jeans in the Game 10. I am trying to catch my luck! – Do you consider this research promising? – I don’t know; we’ll see tomorrow. I have to consider my dress for tomorrow quite seriously! – Did you feel any agitation during the game? – How do you evaluate the course of the match in general? – On the whole, I was better prepared, and obviously had more fresh ideas and winning opportu-nities. I had the initiative in most games, but only managed to convert two chances. 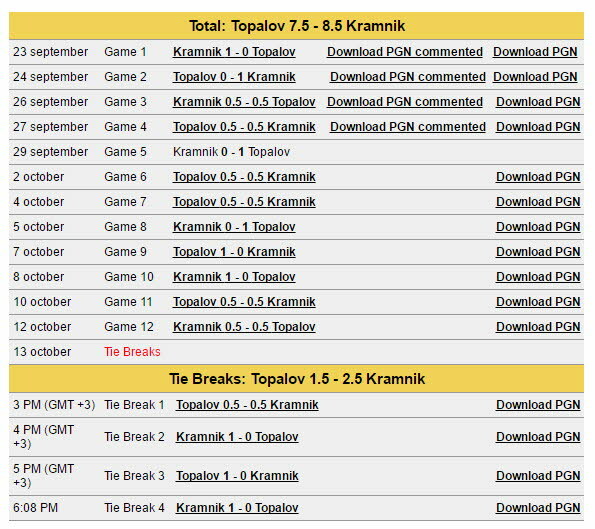 Kramnik, on the contrary, utilized everything he had. It was a very strange match: after a false start I not only managed to tie the score, but even took the lead at some point. And then committed another blun-der, making the score even again. – Do you feel the burden of unforced errors? – It is impossible to make an error if you agree to a draw after 15 moves. If each of your games lasts 50 moves, errors are unavoidable. Errors are natural consequence of struggle! If we always played at maximum effort, there would be more errors – we are humans. – You always play for a win, but if you were told before today’s game that it is going to end in a draw, would you feel happy? – That depends on the way this draw is achieved. I am not satisfied with the way I drew today, because I felt the victory is very near; but maybe the feeling was false, and the position was drawn. – Veselin, how do you see the future of chess? For example, for the next 10 years… How will it develop, and will it become unified? – Unified? I have no idea why some people consider chess split! In my opinion, chess is unified since San Luis. The unification has already taken place! I don’t know what will happen in 10 years. There is FIDE, and there is FIDE President and Ex-ecutive Committee; it’s their business. The only thing I can do as champion is to try improving the image of chess. I cannot solve all our problems. – To be honest, I am still not sure whether we will play 25 or 15-minute games. In general, Kramnik has a small plus… Actually, talking about the tiebreak, I’d rather blunder a queen or a mate in one than appear in the situation of Leko in 2004. He did not yield to Kramnik two years ago, but Leko is nobody now, and Kramnik is a world champion. Tiebreak is a good thing, and it doesn’t matter for me how it ends. If I lose, it will happen because of my own fault, not because of the regulations. – This match arose many suspicions. Don’t you think such scandals will soon scare away eve-rybody but fanatics? – I don’t think the popularity of chess suffered because of the misunderstandings that occurred during the match. Looking back at the history of chess, it enjoyed maximum popularity at times of political confrontation. First it was Spassky-Fischer match, then Karpov-Korchnoi, and then Kar-pov-Kasparov. A high point for 20 years straight! At the same time, only a small group of profes-sionals was interested in pure chess content. Others are excited by scandals. – So, ‘world peace’ does not benefit chess in your opinion? Match is over. Vladimir Kramnik (RUS) won.